You don't need EXPENSIVE clips, rulers, or machines to sew, you DO need a little creativity & a willingness to try….. Sorry for the extended leave! I have been busy with custom orders and some other obligations I can’t publicly write about (yet). It’s May now and with a new month comes the latest Bag of the Month Club Pattern. This is a club where you buy a subscription for 6 months of bag patterns (each released on the 1st of the month from Jan – June). The bag patterns are secret until release but they are all from reputable designers who have large followings and sell many patterns. I test patterns for 4 of those pattern companies….so lucky me! I get to see and sew 4 of them before release. (I am burdened with keeping them a secret as well though!). 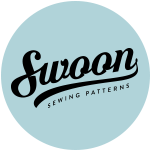 This is a look at the May bag by Swoon patterns. It’s called Louise Barrel Bag. My tester is made up from Bull Dog linen blend by Maker Maker combined with faux leather in black. I used Antique Brass hardware throughout. I love this little bag because it’s a hybrid between 2 of my favourite Swoon patterns. Imagine: a combination of Nora and Blanche and you will get the Louise! Of course, it’s not JUST a mash-up…the construction is VERY different and it’s an easier sew than either of the other 2 bags. I was always being asked to modify Nora for customers to include a zippered top, so this pattern fits the bill perfectly! It also eliminates the final SIDE panel top stitch on Nora (that step is not for the faint of heart and has drawn guttural curse words from deep within me, while sewing that part). Well, NO MORE!!! You will be pleased to know that no curse words were uttered during the sewing of Louise! The zipper extends past the edges of the top and folds down to be snapped onto the side panels. Inside, there’s a zippered pocket included in the pattern but it would be easy to add a divided slip if you wanted more organization inside. Also, included is an optional shoulder strap and connectors for it. This pattern has a unique feature: a zipper flap thingy that hides the zipper underneath. I am not sure if there’s a technical word for that bag anatomy other then Zipper panel or Zipper flap. A picture is worth a 1000 words though so see below. I often photograph my bags among other well known, commonly sewn bags bags to give an idea of scale. Louise was no exception. Here she is with some other Swoons. I also added purse feet on the bottom. Not in the pattern, but super easy to add! Overall, this is a moderately easy and fast sew, that will leave you with a very useful and modern looking handbag! I recommend buying the subscription if you would like the pattern NOW! or if you wait 6 months, then the pattern designer is allowed to release it separately as an individual pattern purchase if she decides she wants to do that. In my opinion, so far…the club subscription has been worth every single cent. I have liked or loved EVERY bag released and with membership you also get the pleasure of the FB group for support as well as general bag maker chatter. Oh, and of course inspirational pics of bags by other makers…my favourite part! There’s one more to go for June and that will be Chris W Designs and it will be a complete surprise for me since I don’t test for Chris W.
Categories: Pattern Reviews | Tags: bag, Bag of the Month club, bulldog, Handbag, linen, louise, review, swoon, swoon pattern | Permalink. Well, here it is….finally. My Blog. After years and years of sitting of the fence about this I finally picked a side and thought WHY NOT? I make bags. I test bag patterns for bag pattern designers. I love taking photos, and I love sharing my tips and little bag making secrets with people! This Satchel type bag is a sweet little one I sewed up to test an upcoming pattern for Hold It Right Here patterns. I used DILL (I love that colour name!) Essex Linen combined with Alison Glass’ new Seventy Six line. The pattern calls for foam, woven fusible interfacing, a flap closure, some D rings, clasps and some zippers as well. piping is optional, but almost ALWAYS gives a a professional look. I do love the look that woven interfacing gives to the exterior of a bag, but i always substitute a NON woven fusible interfacing for the interior. This saves me a bit of money and makes no difference in the end product whatsoever! This is not a huge purse but it has a lot of features! As always, I customized my bag slightly…I added concentric top stitching rows on my flap and installed a Turn Lock closure instead of the Thumb Lock called for in the pattern. I thought this fancy, schmancy Circle Lock looked great with the Alison Glass fabric on the exterior flap since it echoed the circles in her print. I always try to incorporate hardware that goes with the “feel’ of a bag…maybe I am a bit OCD that way, but oh well. Both the front and back have these round cut out slip pockets, the back actually has an additional zippered pocket installed within the slip pocket. Don’t worry though, the instructions on how to do this are very clear and easy to follow. The pattern calls for a shoulder length strap, however my customers LOVE cross body bags so I extended mine to 60″ and added a slider to make it adjustable.. The bag has loads of storage pockets inside including a divided slip pocket and another zipper pocket. The silhouette is outlined in piping, a feature I really love! This pattern will be available for purchase in Hold It Right There’s Etsy shop, and her Craftsy Shop. Incidentally, my bag will also be listed in my Etsy shop for sale. Categories: Pattern Reviews | Tags: bag, Cross Body, Dill, Essex Linen, Glenwillow, Green, Handbag, Handmade, Hold it Right There, Pattern, PDF, purse, Satchel, Sew | Permalink. I guess I’m getting a bit Carried Away….